Seijun Suzuki is one of Japanese cinema’s legendary eccentrics. He was fired from his job at Nikkatsu Studios in the late 1960s for, as he put it, making films that “made no sense and made no money.” Over the last couple of decades, he has developed a global cult following for those stylistically outrageous send-ups of gangster movies, as well as the mysterious ghost stories he created upon his return to filmmaking in the 1980s. Though he is virtually a household name in Japan (he was once voted the country’s best-dressed man), very little has been written about Suzuki in the United States—until now. My book Time and Place Are Nonsense: The Films of Seijun Suzuki has been published by the Freer|Sackler. To celebrate, we are devoting the next three months to a retrospective of Suzuki’s work, co-organized with the Japan Foundation and comprising more than twenty films, some of which have never before screened in the United States. We kick things off this evening with Suzuki’s most notorious film, Branded to Kill, the outrageous excesses of which led to his firing from Nikkatsu. After the screening, I will be on hand to sign copies of Time and Place Are Nonsense. For the rest of the month, you can sample films from the most fertile period of Suzuki’s career: the mid- to late ’60s, during which he twisted B movie scripts into dazzling, funny, and shocking artistic statements. These films are rooted both in the gleefully nihilistic outlook Suzuki gained as a soldier in World War II and in the wild, bawdy underbelly of Japanese aesthetic traditions, such as Kabuki theater, that has fascinated him throughout his career. I hope you’ll join us and come back in November and December, when we delve into Suzuki’s equally fascinating later career. The complete film schedule is available on our website. And if you have friends in other parts of the United States and Canada, please tell them to keep an eye out for the retrospective. Between now and next May, it will be traveling to cities throughout North America. Want more information about films? Create or update your account and select “films” in your email preferences to receive our films e-newsletter! 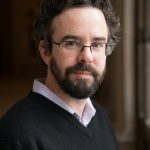 Tom Vick is curator of film at the Freer|Sackler and the author of "Time and Place are Nonsense: The Films of Seijun Suzuki and Asian Cinema: A Field Guide."